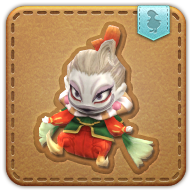 Summon your wind-up Kefka minion. Just can't believe it? Believe it! Other than a vague claim by Y'shtola that the doll you discovered in Omega's Sigmascape seems “eerily familiar,” none of your companions can recall ever hearing of a wicked jester known as Kefka, be it in history books or children's tales.